Tag line: "91,000 People. 33 Exit Gates. 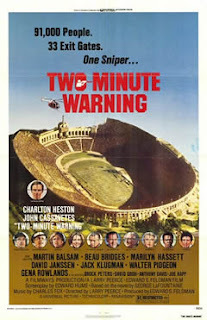 One Sniper..."
Trivia: Universal Studios devised a gimmick where moviegoers were not allowed to enter the theater when the football game's two-minute warning began in the film. The opening scene of 1976’s Two-Minute Warning scares the hell out of me. In it, an unknown gunman, sitting in a hotel room overlooking a neighborhood, peers through the scope of his rifle, resting the crosshairs on a couple of cyclists out for their morning exercise. Though the movie has just started, and we know nothing at all about the gunman or the cyclists, we sense this is a random act, one that turns deadly when the assassin finally pulls the trigger. The murder itself is bad enough (he shoots the male cyclist through the heart, killing him instantly), but it’s the randomness of it all that shook me; the thought that I could be walking in a park, or driving in my car, and someone I can’t see has a rifle trained on me, just waiting to take the shot, is more terrifying than any masked killer or demonic entity could ever be. Yet as disturbing as this sequence is, it's simply a warm-up for the gunman, a trial run to make sure his sights are calibrated. After breaking his rifle down and hiding it in the lining of a trench coat, he walks out the front door of the hotel and heads to his ultimate destination: the championship football game between Baltimore and L.A., which is set to begin in a couple of hours at the Los Angeles Coliseum. After turning in his ticket, the gunman breaks into a small storage room and climbs to the top of an archway overlooking the entire facility. He then re-assembles his rifle and again looks through the scope, moving from one end of the coliseum to the other, making sure he can see everybody. What he doesn’t know is that others can see him as well. Mike Ramsay (Beau Bridges), an out-of-work father who brought his wife and kids to the game, spots the killer through a pair of binoculars. What’s more, the crew of the Goodyear Blimp (which is circling overhead) notice him as they're attempting to focus one of their cameras. The TV control room, located inside the stadium, picks up the feed from the blimp and alerts Sam McKeever (Martin Balsam), who handles the coliseum’s day-to-day operations. Realizing how potentially dangerous this situation is, a visibly shaken McKeever puts a call in to police Capt. Peter Holly (Charlton Heston), who, after arriving on the scene, decides the best course of action is to have a SWAT team standing by. So, he contacts Sgt. Chris Button (John Cassavetes), who assembles his team in the parking lot. To prevent a panic from breaking out, Sgt. Button has his men dress in maintenance overalls, then positions them at several key locations throughout the stadium. But the question remains: who is the gunman’s target? Among the 91,000 fans in attendance are two Governors, the Mayor of L.A., and rumor has it the President of the United States himself plans to make an appearance around halftime. Is his motive political assassination, or is he after somebody else? Maybe he’s a scorned lover, hoping to kill the guy who stole his girl; or is looking to take out his frustrations on a former boss that fired him. Perhaps he bet all his money on the game and now wants to affect the outcome by shooting some key players on the opposing team. Or, most troubling of all, he’s a psychotic whose sole aim is to murder a few strangers. Whatever his motive, Capt, Holly and Sgt. Button know their time is limited; before the game is over, the gunman is going to open fire, and they must do everything they can to stop that from happening. While essentially a thriller, Two-Minute Warning has the look and feel of a ‘70s disaster film, right down to its impressively large cast. Aside from Bridges, Balsam, Heston, and Cassavetes, there’s David Janssen and Gena Rowlands as a couple from Baltimore who simply don’t get along; Jack Klugman as a degenerate gambler in danger of being knocked off if he doesn’t pay his bookie soon; Walter Pidgeon as an elderly pickpocket hoping to swipe as many wallets as he can; and Brock Peters as the Coliseum’s handyman, who, despite the accusations of Sam McKeever, is certain he locked the door behind him, and has no idea how the gunman gained access to the archway. There are even cameo appearances by sportscasters Howard Cosell and Frank Gifford (playing themselves), as well as ‘70s talk show host Merv Griffin, who, prior to the game, sings the National Anthem. Throughout the movie, we get to know some of these characters quite well, and though they don’t realize the danger they’re in, we can’t help but worry about them. Yet as intense as the film can be, nothing that came before it will prepare you for its final moments. More than likely, you’ll remember a good deal about Two-Minute Warning, which, for the bulk of its running time, is an edge-of-your-seat thriller, but I guarantee you won’t soon forget the ending.